Hand-made in Canada using Canadian marine mineral clay. DorMauri Facial Clay Cleanser provides detoxification + deep cleansing, built-in toner, exfoliates dead skin cells and stimulates blood circulation for healthier cell growth. These products are unscented and use low-level preservatives for stability, compatibility, and safety. They are paraben and SLS free, biodegradable, never tested on animals and mild on all skin types. DorMauri Facial Clay Cleansers are gentle enough to be used daily. This first step in your beauty routine thoroughly cleanses the skin, while delivering superior anti-aging benefits. Simple and easy steps to reveal fresh, clean and tightened skin. Firstly, lather clay cleanser under warm water and massage the rich foam in small circles into skin. For extra exfoliation, apply with a soft facial brush and work around the face in small circular motions. Next, gently remove lather with a warm cloth or rinse with water. Pat dry and enjoy the youthful glow! DorMauri Moisturizing Clay Facial Cleanser which is ideal for normal to dry skin. Combining the rich nutrients of DorMauri's unique marine clay with pure rosewater, jojoba oil and sea salt to provide a rich but gentle facial cleanser leaving the skin feeling fresh and therapeutic. DorMauri Tea Tree Clay Facial Cleanser is ideal for oily and acne-prone skin. Drawing out toxins from pores and absorbing the excess oil while tightening and smoothen the skin leaving with smaller pores and brighter complexion. 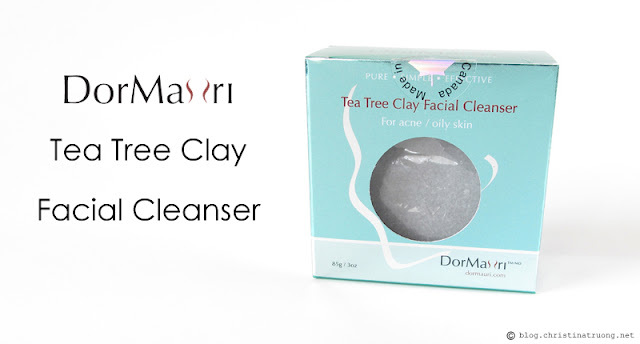 I got to try DorMauri Tea Tree Clay Facial Cleanser and it was amazing! At first, I thought I wouldn't like the scent because my first scent impression was that it smelled medicinal. But after I took out the product from the packaging and lather it under water, the smell was manageable. It still had the smell but very subtle. The cleanser lathered nicely and foamed up as if you're washing your face with bar soap. I was hesitant that my face might dry up but it didn't. I tried both methods of using the clay cleanser; massaging the clay cleanser directly onto the skin and using a cleansing brush. I found that using a cleansing brush seem more effective and build up a lot more foam quicker. Before and after removing the lather with water, it did not leave my face with a squeaky clean feel but rather a smooth clean feel. Which is great because sometimes cleansers that leave skin with a squeaky feel tend to feel rough at the end. Having a smooth feel gives skin a healthy look and feel to the skin. Overall, I really enjoy the facial clay cleanser and its benefits, it left my pores small and skin smoother. However, I wish the packaging was more restoring friendly. Putting it back in the packaging it came in doesn't seem very practical. Want to try DorMauri Facial Clay Cleanser? Use Promo Code: CLNSR30 and get 30% off. Offer valid in Canada until August 31, 2016.